Welcome to the worlds greatest guide to ladies cotton corduroy pants. Take one day at a time. And always put on one leg at a time. Everything else will simply fall into place and the world will be glorious. Pants are garments that cover each leg separately. They are often worn from the waist to the ankle but they come in a variety of lengths. In addition to various lengths pants have several other design features and differences. One of the primary choices is fabrication. What is corduroy? Corduroy is a thick cotton fabric with velvety ribs. It is a textile with a distinct pattern, a "cord" or wale. Modern corduroy is most commonly composed of tufted cords, sometimes exhibiting a channel between the tufts. Corduroy is, in essence, a ridged form of velvet. Both velvet and corduroy derive from fustian fabric. Fustian is a variety of heavy cloth woven from cotton. 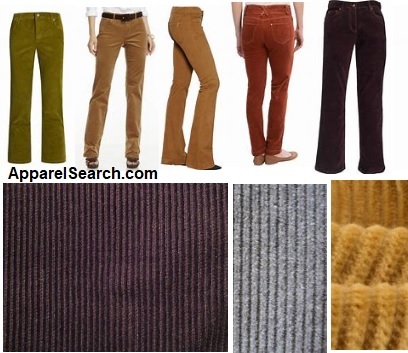 Corduroy is a strong durable fabric with a rounded cord, rib, or wale surface formed by cut pile yarn. The back of the goods has a plain or a twill weave. It is often used for making pants. Corduroy is made by weaving extra sets of fiber into the base fabric to form vertical ridges called wales. The wales are built so that clear lines can be seen when they are cut into pile. The lower the "wale" number, the thicker the width of the wale (e.g., 4-wale is much thicker than 11-wale). Corduroy’s wale count per inch can vary from 1.5 to 21, although the traditional standard falls somewhere between 10 and 12. Standard wale: 11 wales/inch, and available in many colors. Apparel Search is a leading guide to fashion, style, clothing, glam and all things relevant to apparel. We hope that you find this Women's Cotton Corduroy Pants page to be helpful. You may also want to learn more about the benefits of cotton fabrics for making apparel. If you want to be even more stylish, you should wear your Women's Cotton Corduroy Pants.